Allowing your piercing to heal properly is the most important part of getting a new piercing. Without proper aftercare during the healing process, you run a high risk of getting an infection or your piercing getting rejected. Our Piercing Healing Oil fights infections and helps your skin to heal from your new piercing. Our healing oil uses macadamia oil to soften the skin, and combines with jojoba and tea tree oil for an enhanced healing experience. The tea tree oil is a powerful antiseptic, and is one of the best natural ingredients for fighting infections and bacterias. Using healing oil in combination with a salt-spray solution and healing butter will see the best results and ensure a smooth healing process without complications. I had a bump on my recent nose piercing which has been refusing to go and at times has made me consider removing the piercing. I have used salt washes, Elizabeth Arden 8 hour cream amongst other things and I have been really disciplined in keeping my piercing clean so it has been pretty frustrating. 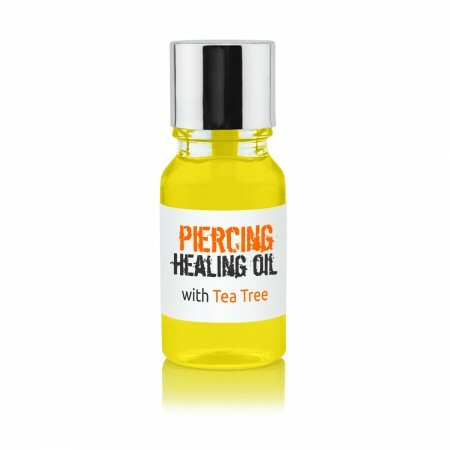 I happened to find this website and after reading some of the reviews I decided to give this a go as I knew tea tree oil is good for skin but I was dubious about using normal tea tree oil as it can be so strong. After using this for a week along with the Salt Spray with tea tree I am so happy with the results, I can't believe how much the bump has gone down and the oil seems to stop the skin around my nose drying out as much too. I don't usually take time to write reviews but I am so pleased at how quickly it has made a difference and I'm now loving my piercing again - I know bumps can be a common problem and I would recommend this to anyone.